Description of "The Balasore Papers"
During the seventeenth century, a number of foreign trading companies, backed by their respective governments, set up small trading posts near sea shore in various parts of India. Being next to the sea was logistically important as both the imports from as well as the exports to Europe were through the sea route. Some of these gradually got converted into towns under control of the foreign companies while the others withered away. Balasore was one such trading post or ‘Loge”, as the French called it, which lost importance with the passage of time and especially because of the development of Chandernagore and Calcutta. However a small piece of land in Balasore remained under the French sovereignity till September 1, 1947. The documents in the present compilation relate to the British and French dispute over that small piecre of land. There are copies of ‘Parwanas’ issued by the Moghul Emperor/ his officers permitting the French to take up trading in Balasore. 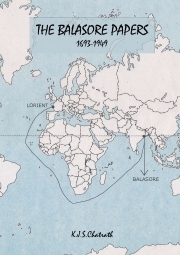 One notices from some of the letters written specifically about Balasore by the Viceroy to the French Governor in India, how important the issue was. There are some letters that throw light on the French diplomats discussing the issue of loges, especially of the Balasore loge, with Pt. Nehru. The compilation also includes three important reports on the Balasore issue prepared by the French, namely the Pilinski Report-1905, the Heron Report-1936 and the De Pereyra Report-1949. Full texts of important Conventions signed between the British and the French viz. the Opium Conventions of 1906 and 1912 and the Convention of 1917 under which the French Balasore land was taken on lease by the British, have also been included in this book. And there are documents hinting at a feeling if not an apprehension or a wish, that India would not be able to sustain itself as an independent nation for long. We can only say with a chuckle ‘What a delusion it was!’, as India has shown to the world in the years that followed. K.J.S.Chatrath worked for the Indian Administrative Service and retired in 2003. He holds a Ph.D. from the University of Paris for his thesis on the ‘Indo-French Diplomatic Relations’. He has authored a number of books – mostly on the France-India interface: ‘The Foreign Policy of France’, ‘India in the Debates of the French Parliment: 1945-1988’, ‘Ver la Lumiere: A Study of the French School System’, ‘France - A Brief Bibliography’, ‘A Glance at France’ and ‘The French Collection’. Out of these, ‘India in the Debates of the French Parliment: 1945-1988’ carried a Foreword by His Excellency the French Ambassador in India and its first copy was received by the Hon’ble President of India. The first copy of the book “Vers la Lumiere: A Study of the French School System” was received by the Hon’ble Vice-President of India. “Reminiscences: Lal Bahadur Shastri National Academy of Administration” of which he was the Co- Editor, was released in September 2010 by the Hon'ble Prime Minister of India. Subsequently “The Last Post: Inscriptions on French Graves in India”, was published in March 2011. The last book that he brought out in October 2011 was “Some Vignettes of Balasore anmd its French Loge”. Presently he is working on his next book on the contributions of some little known Frenchmen in India. Besides France, his other interests are travel and trekking. He stays in Panchkula and can be contacted at chatrath@gmail.com or through his website: www.europeangravesinindia.com. 12. The Last Post: Inscriptions on French Graves in India. Reviews of "The Balasore Papers"